Chrisie and I often joke that we’ve never really lived alone, just the two of us. That’s an exaggeration of course, but it is grounded in truth. Even in the first years of our marriage, we played host to several people who just needed a place to stay. The person who lived with us the longest is now my brother-in-law, and I can only hope I’ve had half as profound an effect on him as he did me. I didn’t really know Matt at all when he came to live with us. He decided to leave where he was living (and it was a good decision), but his plans fell through and he ended up with us. I was troubled and worried at first, but now I am deeply thankful that he did. He lived with us for two years, the first of which I worked second shift. That year, Matt formed the bulk of my social life. I worked four to midnight in Nashville and usually added at least a couple of hours of overtime. Chrisie was still in school, so she was gone when I woke up and I left for work before she got home. Pretty much everyone I knew was asleep when I was up and vice versa. Matt was the exception. I got home at one or two in the morning and he was still playing video games. We sat and talked about anything and everything. Part of it was that we were the only two awake. In the beginning, even though I didn’t know him well, I still had a measure of respect for Matt for two main reasons. One was the decision that brought him to live with us. The other was how he handled another situation. It’s no secret that he and my wife’s sister had their daughter while they were still in high school. One thing that always impressed me about Matt was that he never backed away from his responsibility, or down from my father-in-law. He intended to participate in his daughter’s life and didn’t care what he had to endure to do so. For me, he was the definition of a stand up guy. He had his faults (still does), but never let them distract from what he believed needed to be done. I never had to ask about his thoughts on my niece, because he shared them freely during our late night talks. I remember the night he convinced me (though that was not his intent) that I could be a good father even though he didn’t know that’s what I was thinking about. He asked me to proofread a paper for one of his classes at APSU, but couldn’t have imagined the impact it would have. Chrisie was ready for a child long before I was and she, um, clearly expressed her desire for us to become parents. I had misgivings for a variety of reasons, not the least of which was a fear of not being a good father. Matt wrote about the responsibilities of fatherhood. It was partially a response to something a classmate had said and partially just his thoughts on being a father. 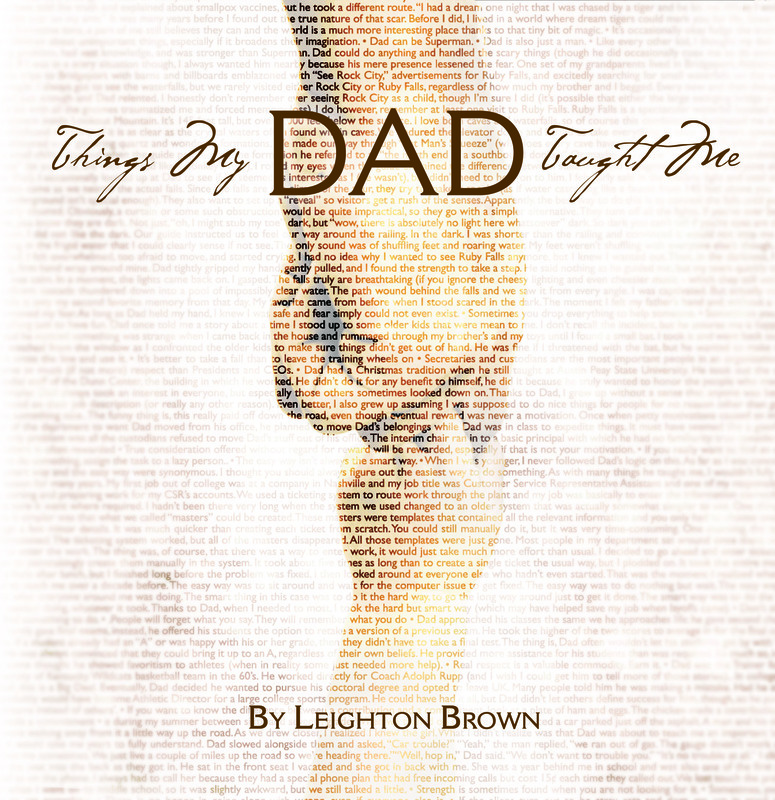 As I read, I realized that not only could I be a good father, but I wanted to be one. It was nearly a year before I admitted it to my wife, but that was the night I finally glimpsed what it takes to be a good father. I saw it in Matt’s paper, but I more saw it in him even as he played Xbox. His love and drive for his daughter was palatable and I saw, in a moment, how I could be one as well. He still lived with us when our daughter was born, but soon moved out. A couple of years later he married Chrisie’s sister. I told him at the time, but I still wonder if he really believes that I was excited to become related to him. That excitement came from our late night talks, but also from one of my favorite memories of when Autumn was born. I had a terrible night in the hospital, mainly because there was nowhere for me to sleep. In the morning, Chrisie insisted that I go home to rest. I consented to going for a shower, but planned to return immediately afterwards. When I got home, I found Matt asleep on Chrisie and mine’s still made bed. He lay on top of the covers and clutched the phone as the television droned in the background. I tried not to wake him, but he stirred anyway. “Is it morning?” he asked. In that moment I understood, better than I ever had before, what it takes to be a good father. Real love. Real compassion. Real desire to see it through. Even if he reads this, he may never know just how much I learned the morning I saw him asleep on my bed with the phone. The moment I saw that he knew what it takes. This entry was posted in Stories and tagged brother-in-law, daughter, family, Father-in-law, fatherhood, life lessons, parenting, postaweek2011. Bookmark the permalink. A radical understatement, but, yay for good family! I agree 100% Matt is a class act and someone I respect very much! !